Flush mount pre-punched flange for easy installation. Materials needed: Caulking Sealant and Screws. Measure the width and length between the rough opening. Note: Measuring the outer frame of an existing window will result in incorrect sizing. 1. The rough opening should be 1/4" greater in width and height than the portion of the window that fits in the rough opening. The rough opening sill must be square to the floor within 1/8" across its width. If the rough opening sill is out of square by a greater amount, it may not be possible to shim and square the window in the opening. 2. Inspect the exterior face of the rough opening where the mounting flange of the window will contact. This area must not have gaps or voids beneath the mounting flange. The sheathing or exterior wall material that the window will be fastened to must be structurally adequate so that the window unit is fully anchored. 3. Inspect the mounting flanges to ensure they have not been bent or distorted during shipping and handling to the extent that they will not seat flat against the exterior perimeter of the rough opening. If bent or distorted, straighten the mounting flange so that it will make contact with the exterior face of the wall. 4. Windows must always be closed during installation. Make sure there are no gaps and voids between the mounting flange and the exterior perimeter of the rough opening. Gaps or voids in this area may provide a path for water and air to enter. 5. Apply a continuous 1/4" bead of sealant caulk to the backside of the mounting flange, in line with the pre-punched holes or within 1/4" of the outer edge of the mounting flange. If using a sealant caulk, be sure to install the window before the sealant sets up on the mounting flange. 6. Place the window in the rough opening with the window sill resting on the rough opening sill. If the rough opening sill is not square to the floor and if you have elected to shim the window, place the shims beneath the lower corner of the unit until the sill of the unit is square. Shims must be placed beneath the extreme corners of the window frame, additional shims must be placed every 12" on center to fully support the weight of the unit. Do not use shims on the header, or building loads will be transferred to the window, causing improper operation or failure of window. 7. Center the window from left to right, but do not remove the sill from contact with the rough opening sill and any shims that were required to square the sill of the unit. 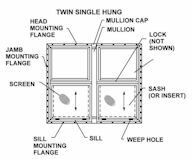 While holding the window flat against the exterior wall, start a corrosion resistant Hex Head Screw in the approximate center of one of the frame/jamb mounting flanges. Continue installing screws in the following order: Center of opposite frame/jamb, center of head and center of sill. Re-check the window to be certain it is centered from side to side in the opening, and that the window frame members are straight and the frame is square. Check to ensure the window operates properly, if it does not, remove the screws and reinstall. Continue installation of the rest of the screws, starting in the center of each member and progressing out to the corners. Note: Do not over drive the screws; to do so will unduly deform the window frame and compromise the seal. Note: It is possible to install the window "upside down" and or "inside out" which will cause the window to operate incorrectly. The weep holes are always at the bottom of the window, never fill, modify or block weep holes. Our modular has the typical crappy trailer windows, drafty, ugly and weird sizes so you can\'t just run and buy one local. We plan on replacing all of the windows soon but had a kitchen project that couldn\'t be completed until that window got replaced, so we went on and just bought the one for now. It was easy to install and looks so much better than the old one. Can\'t wait to do the rest of the house! I had to replace a window as part of a bathroom renovation. The old one was a mobile home window so I was able to get the exact size I needed. Window is just as described in online description. Was easy to install, it fit the framing perfectly and works great. I would highly recommend this window. very happy with the service, shipping and product. I was very impressed with the safe packaging done on the window for shipping, arrived on time and in perfect condition. lOVE this window, fit like a glove, vinyl siding a little tough to work in the cold. thankyou very much.they were very easy to install. Great window for the money. It was much nicer then the original one. Easy to install would buy again. Shipped fast,easy to install,good features! Love the window. My daughter and I installed it in under 30 mins..
Great window for the price! I recently bought a 1965 Conestoga mobile home which needed replacement windows. The windows I purchased are very sturdy and of great quality. They were very easy to install. Yes, they are made to fit in the very slim framing of my trailer. I will be purchasing three more with in the next week or so. I am glad I bought this window. I bought an older mobile home in Bullhead City that had the old single pane, crank open windows. I replaced them with the Vinyl series Kinro windows and they work great. Dual paned, well sealed and easy opening. They\'ve reduced noise levels in our living room substantially too. The only problem with the less expensive vinyl series, is these windows likely will not meet the building code energy efficiency requirement for your state if you live in an extremely warm or cold location. For those locations, purchase their \'Low E\' series. I\'ll be buying some of those next for the bedrooms. I\'ll be sure to post how they rate compared to the lower cost, vinyl series windows from Kinro. The fit was perfect, so easy to install too. I have a bit of handyman knowledge but not a lot. The hardest part was taking the old window out. I installed the new window in about 10 minutes after the old one was out. No air leaks whatsoever, perfect since the old window was terrible. Thank MHPS! This window is just as good as any you will find, but at a better price. Shipped fast and well. This window is perfect for my needs. I have a 1972 mobile home that needs new windows badly,and this one fits perfectly to my existing rough opening. It fit like a glove. In 20 minutes I had caulked and screwed in place.It was delivered when it was supposed to be delivered, too bad I had to wait for the weather to cooperate. I just received my latest order of two more windows, again on time.Hats off to the crew who packed the windows. Great job. Unlike the other mobile home site, which has terrible bubble packing. I will be ordering more windows from this site until I run out of windows to replace. Thanx Mobile home parts store. Q: What is the depth of the window ? Q: are windows double pane? Q: Does the window include a screen? Q: Are these available in brown? A: Vinyl windows are only available in white.